Update: Had these maybe a year now. I still like them a heck of a lot. A good purchase. Highly recommended if you’ve got the space. 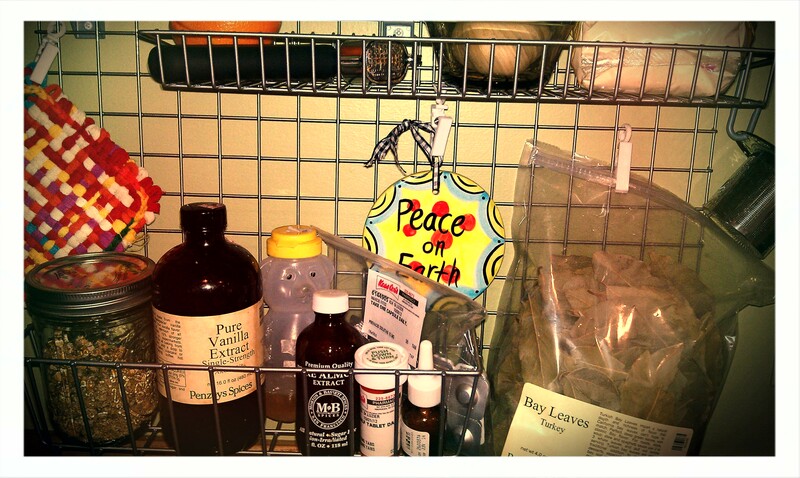 Keeps my cabinet space free and things I use frequently right there ready to be grabbed and used: vanilla, cinnamon, oregano, garlic, straws for the kids, oil, paring knife, measuring spoons, vegetable peeler–you name it, it’s right there at my fingertips. 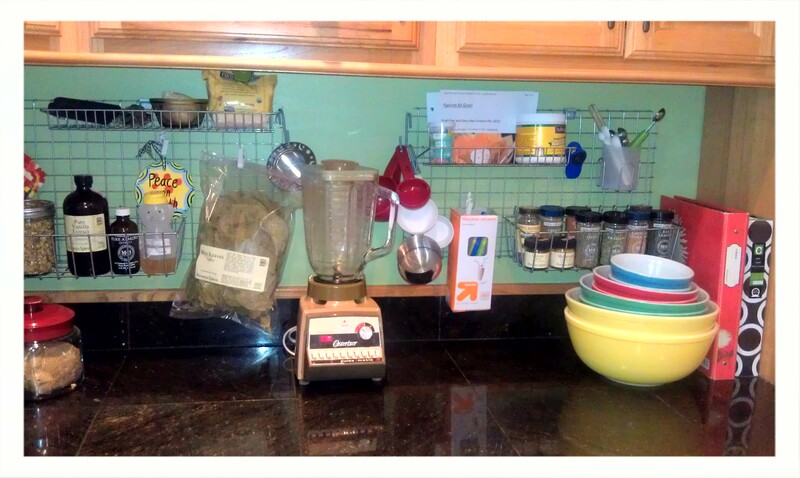 A minor (very minor) complaint is the cup to hold my measuring spoons and vegetable parer wiggles a little bit on the rack as I try to get things out. I like to write about products I like because what comes around goes around. Before I make a purchase, I like to read reviews. Sometimes, there aren’t many reviews out there to go on. Before I bought these, I couldn’t find too many reviews on them. So now here is one for those of you searching about them. Are your spices falling out of the cupboard? Does everyone put them back in the wrong spot after they use them? Are you tired of getting your cupboards and drawers sticky and dirty when you get into them to get out a knife, a measuring cup, a measuring spoon, or the vanilla–with your messy hands? With these racks, nothing is falling out onto my head when I open a cupboard anymore. Love it! Thanks to my father-in-law for installing these, too. But, he said it was easy. I got the small wall grid size, some clips, some hooks, the storage cup, and a couple of different size and heights of shelves. I have had NO problems with these yet. If you can fit them under your cupboards, they are so worth it. And they were delivered in a cute box in about 1-2 days from The Container Store! 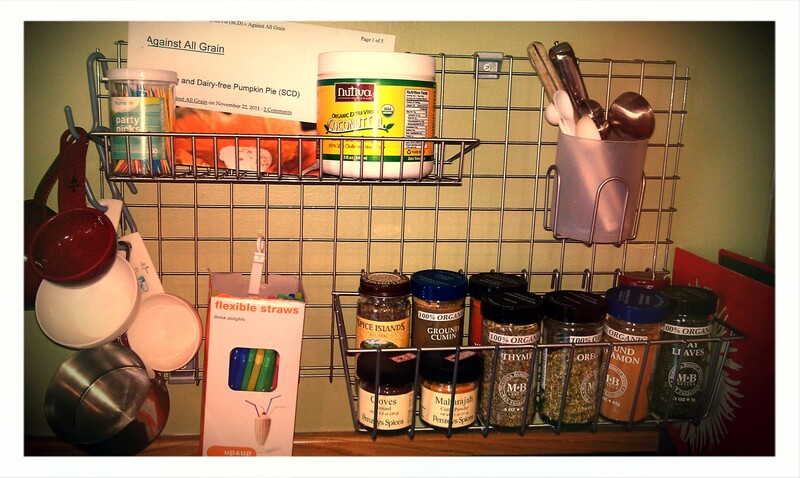 This entry was posted in For the Home, Odds and Ends and tagged and a whole foods diet easier, making GAPS easier, making SCD, organizing your kitchen, paleo, Polytherm grid wall storage system from The Container Store, review of polytherm wall grid, simple kitchen upgrades on March 15, 2013 by thehomeschoolingdoctor.